As October ushers in the autumn sun and crisp winds, Frenchtown celebrates this colorful month with “Frenchtown in October.” Each weekend in October, locals and inspired travelers are invited to the streets of Frenchtown for fall events and activities. Starting Saturday, October 6, Frenchtown’s diverse community of shops and businesses will warmly open their doors to customers and browsers, while presenting family-friendly activities and entertainment. 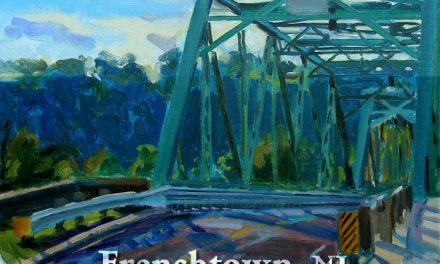 “Frenchtown in October” was inspired by the community’s desire to celebrate and share the town’s historic beauty, upbeat and artistic, yet tranquil setting. Fall decorations, sponsored by ShopRite of Hunterdon County, line the streets, highlighted by 20 scarecrows proudly created by Frenchtown Elementary School students. “Frenchtown in October” is as change-filled as the month’s weather. Come back and visit every weekend for new activities, specials. Restaurants will be offering special fall menus to compliment their already delicious cuisine. Alchemy Art Wear and Gallery – Alchemy will be hosting live music every Saturday with performances by Bliss. Stop by on Sunday, October 14th to see adorable Australian Shepherd puppies! Blue Fish Clothing – Visit our beautiful shop at 62 Trenton Avenue, next door to Lovin’ Oven and Two Buttons. We specialize in organic, artisan crafted and always made in the USA women’s clothing. We will be holding a special raffle along with 10% off your entire purchase including our new beautiful fall clothing collection. Book Garden – Will be holding their 2nd printing party on October 6th. Three book signings, poetry readings and music throughout the month. Cathy Smith Design – Will be holding a “Count the Candy Corn” contest each Saturday with the lucky winner receiving a $25 gift certificate. Join us on Friday, October 12th between 3-7pm for live music by John Beecher. Be sure to stop by on Saturday, October 13th to enjoy jewelry and accessories from around the world. A great opportunity to get ready for the holidays. Designs for Tranquility – Stop by and see our endangered species puppets. Our little friends will be available the first and second weekend in October. They are simply amazing! Eat Cake – Stop by one of Frenchtown’s newest eateries and sample delicious handmade pastries. A focus on our delightful fall produce is the key ingredient in many of the pastries. Glamtastik – Halloween is just around the corner. A special sale of 15% off all in-stock ladies costumes will be offered. What a great way to be the belle of your Halloween ball! Grouse Studios – Will be holding a photo exhibit and sale. Stop by and see beautiful one-of-a-kind items. Many are handmade and unique. Start your holiday shopping early! Stop by and visit with us at our new location in Milford. We are offering a delicious variety of autumn favorites and tantalizing foods that are good for the body and soul. We will be hosting a Kimchi demonstration on Saturday, October 6th during the Milford Alive event. Left Bank Home – Join us for our annual “Leather Weather” sale with up to double discounts on beautiful leather furniture. Lovin’ Oven – Bring the kids out for fun with Lolly Hopwood on Thursday, October 18th between 11 am and 12 pm. A special kids menu will be served (weather permitting). Join us for our “Farm to Table” event. We will be hosting live music and a special menu to delight your senses on Wednesday, October, 24th between 6-9 pm. Fall wouldn’t be the same without pumpkin and face painting! Join us on Saturday, October 27th between 11 am -3 pm (weather permitting). Modern Love – Stop by and check out our cool line of vintage clothing. Just in time for Halloween! Paddle Creek – End of season closeout with savings of up to 20% on selected models. Fall is a great time to kayak on the Delaware and take in the beautiful surroundings! Purple Kangaroo – Will be hosting solo artist guitarist, Pat Carmona featuring the music of Joe Satriani on Saturday, October 13thbetween 2:00-3:00pm. Sarah B. from Amber Dog Studio will be giving a painting demo on Saturday, October 27 from 2:00-4:00. River Blue Café – Will be hosting live music each weekend from local performers. A special autumnal menu is planned to delight your taste buds. River Gypsy – Stop by and see our beautiful line of organic, recycled, Fair Trade, Made in the USA lines of clothing and accessories. A 10% discount will be offered throughout the month of October. Spinnery – Join us for a “yarn tasting” on October 20th between 1:30-3:30pm. Samples of our beautiful new yarns will be available. We are holding a variegated dyeing class on October 20th between 10am – 1pm. Buy something pink and receive 10% off your purchase. Donations will be made to Breast Cancer Awareness. Supatha Yoga – We will be hosting our first ever “Open House for Health & Healing” on Saturday, October 13th, from 12:00noon till 6:00pm. FREE Classes, Guest Speakers and Demonstrations throughout the day. A lite fare will be provided for participants. Supatha Yoga is located above “The Valley Florist” at 205 Harrison Street on the 2nd Floor. Thistle – A special sidewalk sale is planned for every Saturday in October. Great finds await you! A painting demonstration will be held each weekend featuring Caromal Coulours paint. Gold leaf, stenciling and glazing are just a few of the wonderful techniques we will be demonstrating (weather permitting). Two Buttons – Stop by and see our beautiful and unique selection of imported goods. Furniture and large items on sale for up to 30% off until they are gone. What’s Brewin’ at Marias – Let us temp you with our delicious homemade seasonal pumpkin muffins paired with a hot apple caramel latte. Yum!!! Yellow Dog Pet Supply – We will be hosting a pet rescue every Saturday. Treat your new best friend to a delicious pumpkin patch cookie – free with a $25 purchase! 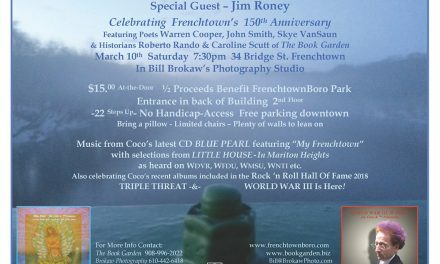 For more information about Frenchtown in October, visit the Frenchtown Business and Professional Association website at www.frenchtownnj.org.